A year and a half ago, I was inspired to visit Rainbow Mountain also known as Vinicunca when I came across its beauty on an Instagram post. I've done numerous hikes on my travels, but I've never seen a multi-colored mountain before. I knew I had to see it in person sooner than later. During my recent trip to Peru I finally made this dream a reality! But, like anything worth having, hiking Rainbow Mountain was not easy! Here's everything you need to know to prepare for this challenging journey. Located in the Peruvian Andes, Rainbow Mountain is a colorful mountain range near the Ausangate Mountain. The multi-colored beauty sits at an altitude of 17,060 feet (more than half the height of Mt. Everest). Rainbow Mountain gets its rich colors from sedimentary mineral layers that have been uncovered by erosion. Despite being discovered two years ago, Rainbow Mountain is quickly becoming a must-visit place in South America. Peru has a wet and dry season. Ideally you should visit during the dry season which takes place from March to November. Specifically, the months of June to September is the recommended time. However, this is winter for Peru, so snow is possible during that time frame. You can expect more sunny days from June to September, but it is also high season so expect more crowds. Our Rainbow Mountain hike happened towards the end of our 9-day trip to Peru, in order to give our bodies' time to acclimate to the high elevations. Days leading up to the hike, I was constantly checking IG for weather updates (at times it seems more accurate than the weather report). I wanted to view weather conditions on the mountains in real time. There were pictures of people with full on blizzard attire just 3 days before our planned hike. I was nervous because while I was prepared for a cold hike, I wasn't prepared for a snowy hike! I was conflicted, what's the point of going to Rainbow Mountain, if we weren't going to see a Rainbow? But on the other hand I planned my Peru trip for this moment. Fortunately, the day before our hike, weather conditions improved. 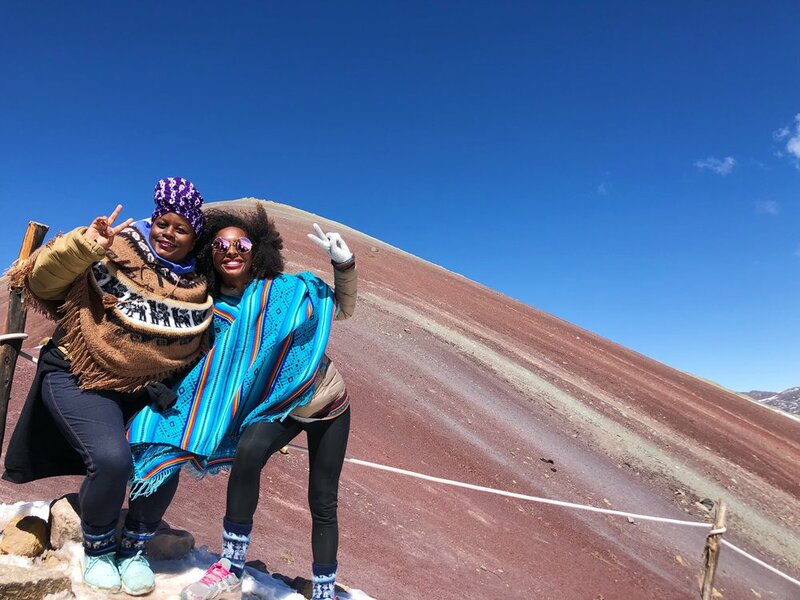 Beyond taking a day trip tour from Cusco, a more adventurous and time-consuming option for getting to Rainbow Mountain includes a 6-day Ausangate trek. 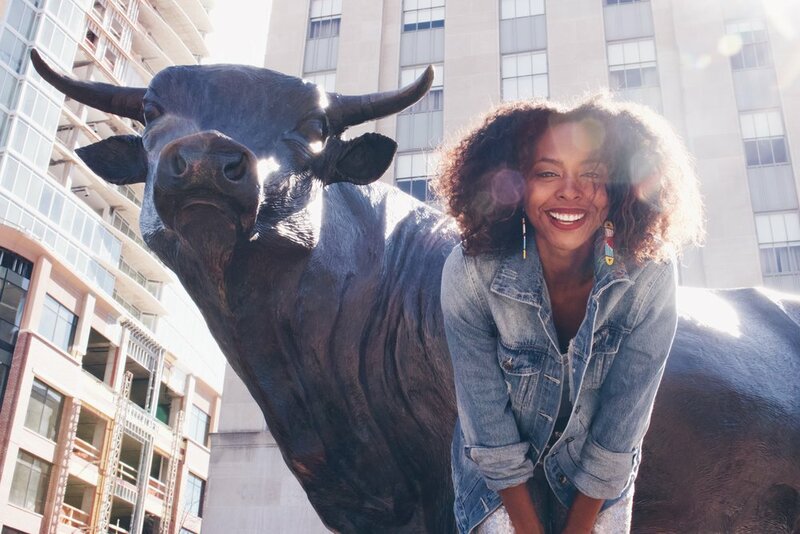 As a travel planner, nothing brings me more joy than to be able to pre-book my excursions in advance, so I don't have to worry about logistics while on vacation. However, sometimes, as it is with Rainbow Mountain, this isn't the best option because you can get overcharged. Instead of pre-booking online I strongly recommend waiting and purchasing in Cusco. You can save up to $100 by booking in person directly. Whether you decide to book online or in person make sure that you have flexibility of changing the date of the tour last minute. As mentioned, the weather on Rainbow Mountain is volatile, one day it's clear views and another day could be a snowstorm. We booked our tour in person a day in advance (weather can't be accurately predicted more than this). After days of snow, I was happy to see that the Rainbow Mountain was going to be sunny during our trip. Also, a lot of the snow had already melted on the trail. What to look for in a good package? Mini-bus with 12 other passengers- The size of the bus is something you should inquire about. The road to Rainbow Mountain is very bumpy and narrow. It's not the type of roads you want to travel in a big bus on. What wasn't included in the package was the 10 soles (3 USD) admission to Rainbow mountain. What to pack for Rainbow Mountain? Layered clothing- I'm the friend who is always cold, so I played no games with my layers. On my bottom, I wore Uniqlo's Heat tech leggings, another pair of leggings on top of that for extra warmth, and my alpaca wool socks. On top, I wore a Uniqlo Heat tech top, a fleece sweater, and a poncho. During the hike, the temperature got progressively warmer, so I took off a few layers, however once we were on top of mountain it was windy so I put them back on. Waterproof jacket or rain jacket- And if all of the above wasn't enough I wore my Uniqlo Light-Down jacket. Having a water-proof jacket is an essential if you are traveling during wet season (December to February). Hat, scarf, and gloves- I intended on bringing a hat, blanket scarf, and gloves. 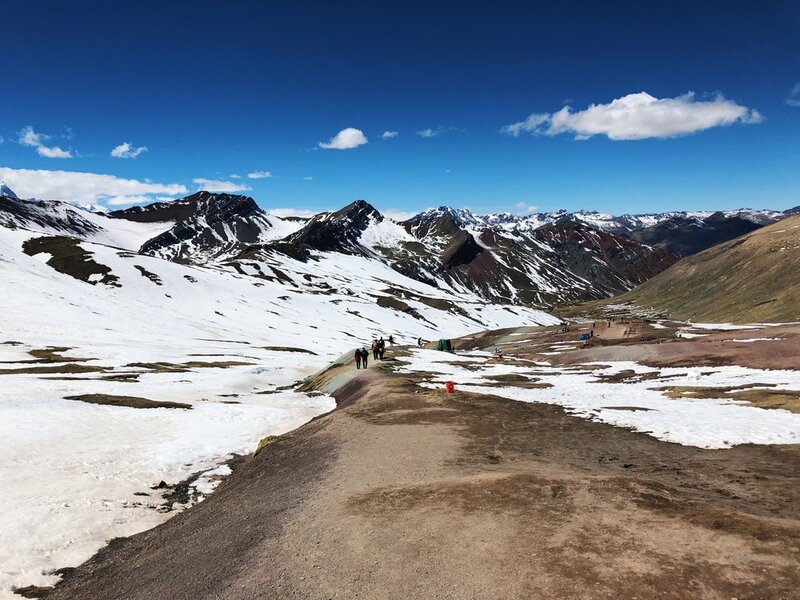 However, when we got to Vinicunca, it was much warmer than I expected, so I left my hat and scarf behind (with confirmation from the guide that I would be comfortable with what I had on). Athletic shoes- I wore my sneakers that I typically use on my hikes, however, I would recommend bringing hiking shoes. At the top of the mountain it was really icy and slippery, and my sneakers didn't provide me with enough traction to climb to the summit safely. Extra clothing- We were advised to bring extra clothing just in case we got caught in a snowstorm on the mountain. Luckily, we had a beautiful sunny day and didn't need to change. Sunglasses- The sun is incredible bright there. Sunscreen- We are more prone to sunburn at higher altitudes. Snacks- Although meals were included in the tour, packing snacks is always a good idea. There are also locals selling snacks along the trial. 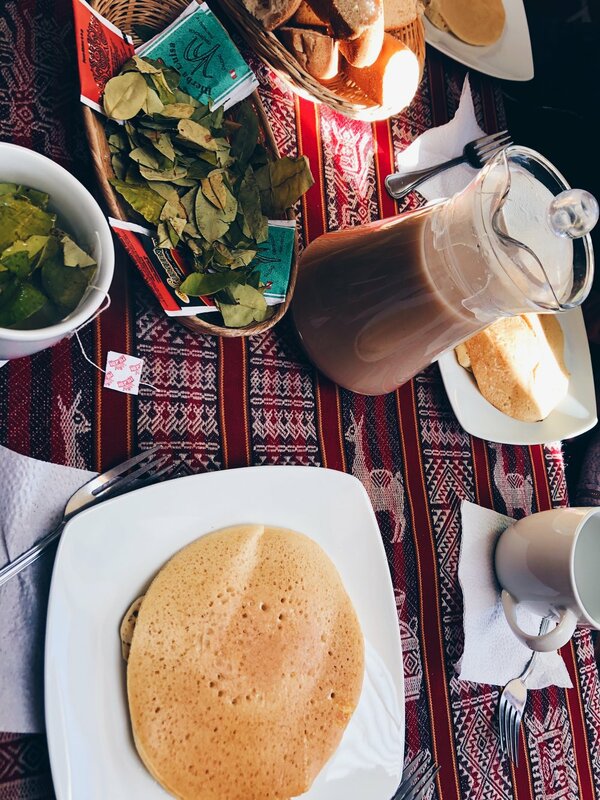 Coca leaves/ Coca candy- chewing coca leaves and/or having a coca candy while you hike can also help mitigate any altitude related sickness you may feel. Toilet paper- There are plenty of squat toilets along the route, however you will need to bring your own toilet paper. Pro-Tip: If you find that you didn't pack properly for Rainbow Mountain, and are in need of some essential items, but don't want to buy something you already have at home, renting is an option at some tour companies. Wayna Peru Expeditions offered rentals for winter coats (25 soles and 50 soles safety deposit) and walking sticks for 1 sole per stick (it's cheaper to rent here then near Rainbow Mountain #supplyanddemand). What is the journey to Rainbow Mountain like? Our journey to Rainbow Mountain started out a little rough, we were told that we will be picked up anytime between 3:30-4am from our hotel lobby. But, the guide was late, so we left our hotel a little past 4, but didn't leave Cusco until after 5am because our guide was waiting for two guests. The 12 other uncaffeinated, aggravated passengers complained that it was ridiculous to wait so long for two people when the majority of people were here on time. Needless to say, beyond that moment, our journey went smoothly. The ride from Cusco to Rainbow Mountain is about 3.5 hours long. We stopped for breakfast in a town an hour outside of Rainbow Mountain. The last leg of the bus-ride was a bit terrifying. The roads were a lot less paved and narrow. I made the "mistake" of looking out the window to soak in the glorious view only to find us on the brink of the edge of a cliff thousands of feet high! I got through that moment with a couple of prayers and deep breaths. How long is the excursion/hike? The entire excursion is practically all day, you typically begin at 3:30am and arrive back in Cusco around 6:30pm. 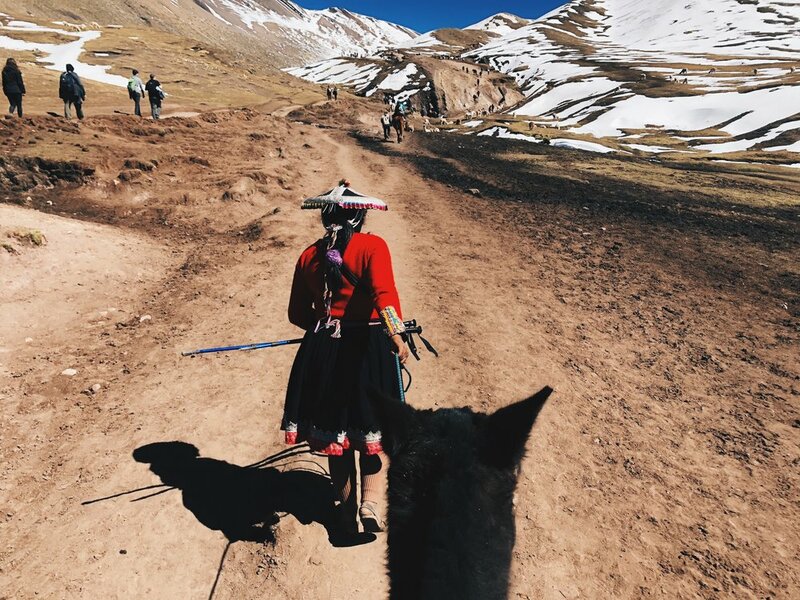 Locals are able to easily hike Rainbow Mountain in about an 1-2 hours. However, it took us beginners about 3-4 hours to arrive at the top, and 1-2 hours to get back down. Due to the cold temperatures on top of the mountain, our guide gave us only 30 minutes to safely enjoy the view and take pictures. The time it takes you to hike varies widely based on your hiking ability and your adjustment to the altitude. The trail begins with a level-footed trek that takes about 20-40 minutes to get through. During this time you will see a lot of horses and their owners available for rental to go up Rainbow Mountain and back. You should be able to haggle the cost to 90 soles (about 30 USD) roundtrip, 60 soles for one way. I was able to trek for about an hour before my body was like, " girl, you better get us up on a horse before we collapse". Ok, maybe that was a bit dramatic, I probably could have made it without the horse, but as the trail started to incline every step I took became harder and harder, and I was feeling more and more winded. I realize I didn't have to prove anything to anyone and I happily got on my horse one-way for 40 soles (about 12 USD). 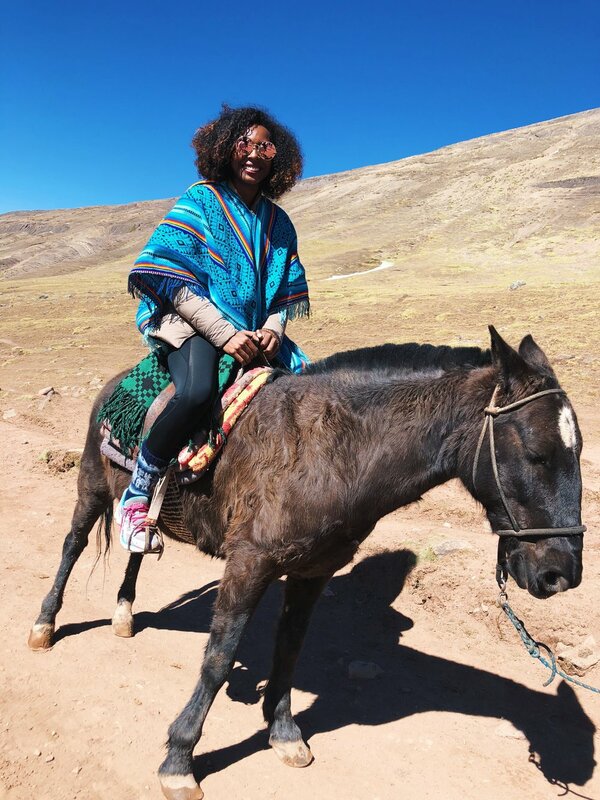 Being on the horse was the greatest decision, instead of worrying about passing out, I was able to truly live in the moment and enjoy the amazing views of the large snow capped mountains and hundreds of llamas and alpacas. The Ausangate local community is actually one of the only remaining shepherding communities in the world. The second half of the trek was more difficult because the incline is steeper and the terrain is messier. The last 30 minutes, (the final incline up Rainbow Mountain) is so steep, you can't take a horse up. I took my time going up it as it was slippery from the snow. Despite being unable to reach the final viewing point because of my sneakers, the views were still mind-blowing! The colors weren't as vibrant as the heavily filtered pictures on IG, but I still found it to be magnificent. After our 30 minutes was up, we headed back down. I actually felt symptoms of altitude sickness going down more so than coming up. I had a terrible headache and felt light-headed. Unfortunately, there weren't many available horses so I walked the entire way back. If you think you may need a horse, make sure you ask for your horse to wait for you to return. Our guide provided me with some floral drops to inhale that offered temporary relief. I'm 100% certain that my symptoms were caused by me not drinking enough water. On the ride back to the restaurant I took ibuprofen, drank a bottle of water and napped. I still felt sick and could barely eat lunch, but I forced myself to eat soup and a lot of bread. I slept the majority of the ride back to Cusco and woke up feeling much better. Overall, my journey to Rainbow Mountain, one of the most fascinating geologic wonders of the world, was well worth all the effort it took to get there.